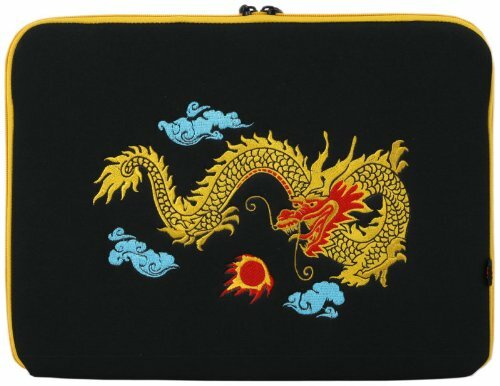 Let this eye-catching embroidered Chinese golden dragon netbook slipcase dress up your beloved 15 inch notebook laptop. The three-quarters zipper with top internal elasticized retention straps hold your top flip of notebook in place while the notebook still sit in the case, perfect for browsing the web and sipping a cup of coffee. These elastic straps also secure the smaller laptop netbook within the sleeve without shifting around. This slip case allows the sleeve to slip into your briefcase, backpack or messenger bag. If you're tired of making excuses for all the nicks and dents on your laptop, let this laptop carry case come to your rescue. * Due to monitor variations colors may appear slightly different.